If you are looking for marketing data to expand your business in Canada, Blue Mail Media’s Canada Email List can give your marketing campaigns the momentum you are looking for. Our database can connect you with key decision makers, business executives, and professionals across Canada and facilitate seamless interactions between you and your target market. Whether you wish to connect with your prospects via mail, email or telephone, our database gives you all the marketing information needed to meet the purpose. Blue Mail Media has a strong data partners network in many countries including Canada, which enables us to serve clients with most reliable and qualitative data in a global yet local way. Our adroit team of data scientists, experts and analysts meticulously collect data from genuine sources, verify data to check accuracy, and update the same on a constant basis to ensure our Canada Business Email List database helps you gain better response rate, conversion rate and eventually better ROI. 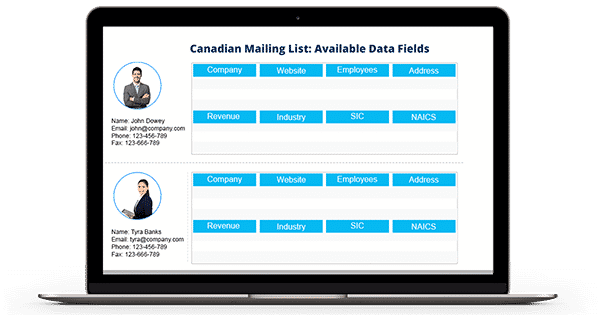 Over the years, we have acquired a huge database of Canada Email Database that lets you precisely reach your target market and promote your offerings with ease. We know that each business has unique requirements and the ‘one size fits all approach’ doesn’t work for all. This is why, we offer our clients enough flexibility to choose from our pre-packaged Canada Mailing List based on the specific industry you are looking for, or get your list customized based on your campaign specific requirements. We believe our Canada Business Executives Email List can give you the competitive advantage to carve out a special place in the heavily crowded market. 1. How precise is the data in your Canadian Email List? - The data we offer in our Canadian Email List is highly accurate and dependable. We have taken extra care to deliver you the 100% authentic data with 85-90% of accuracy and beyond 90% deliverability rate. Our team maintains this accurateness by performing quality checks and updating the database every 90 days. 2. Is it possible to target the prospects worldwide using your Canadian Mailing Lists? - Yes. You can easily target the audience all over the globe using our Canada Mailing Lists. Our list covers the information of key decision makers and executives in several regions such as the US, the UK, North America, Canada, Europe, Australia, Middle East, South Africa, Asia, and many more. 3. Do you have any customization option in your Canadian Email Database? - Yes. We give you the customization option for our Canadian Business List. It lets you meet your business necessities quickly without any worries. You can segment the data we provide in our list based on your interest such as location, job title, company’s revenue, SIC code, NAICS code, and other factors. 4. Which are the different data source you rely on for Canadia Business Lists? - We rely on multiple highly authentic and internationally trusted sources to compile our Canada Business Email Database. The sources include yellow pages, corporate websites, job listings, surveys, press releases, government records, magazines, business directories, conferences, trade shows, events, meetings, and others. 5. Does your Canada Business Executives Database follow the guidelines of GDPR and Anti-Spam law? - Yes. We designed our Canada Business Database with utmost care so that it obeys all the guidelines of GDPR and Anti-Spam law. 6. What data will I get if I buy your Canadian Decision Makers Email List? - Once you avail our Canada Decision Makers Email List, you will gain access to all the essential marketing information of your target prospects. The data includes- first name, last name, phone number, company, job title, company size, revenue, geographical location, web address, SIC code, NAICS code, and many more. 7. In which format will you send your Canadian B2B Email List? - We will send you our highly reliable Canada Business Email List in Microsoft Excel format via email.